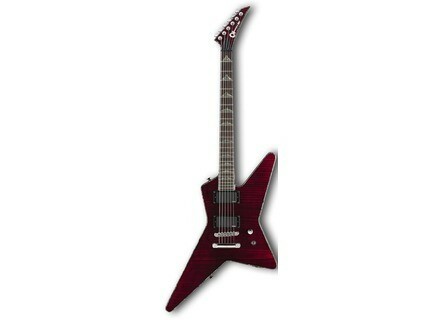 Desolation Star DST-1 ST, V/XPL/FB Shaped Guitar from Charvel in the Desolation series. Charvel announces the return of two classic body shapes, both in sleekly modern Desolation series form. The DST-1 ST Star marks the return of Charvel's classic Star body profile, with features including a neck-through body, maple neck, compound radius (12"-16") rosewood fingerboard with 24 jumbo frets and Charvel "shark tooth" inlays, EMG 85 (neck) and 81 (bridge) humbucking pickups with black bezels and three-way toggle switching, single domed metal volume control knob, stop-tailpiece bridge, locking tuners and black nickel hardware. Available in Black and Snow White gloss finishes with matching headstock; flame maple-top models also available with multi-ply binding (body, neck and headstock) in Trans Red, Trans Black and Trans Blue Smear gloss finishes with matching headstock. The tremolo-equipped DST-1 FR Star shares the same features and finish options, with the exceptions of having a Floyd Rose locking tremolo and sealed die-cast tuners. [NAMM] Hayden Bespoke Program Launching at Winter Namm 2012 Hayden Bespoke is the new personalisation programme from Hayden Amps. [NAMM] Eric Johnson EJ1250 Signature 12" Speaker Eminence announces the addition of a signature 12” alnico guitar speaker developed with guitarist Eric Johnson, the EJ1250. [NAMM] New Squier Artist Series Models Squier introduces the Avril Lavigne Telecaster, the Jim Root Telecaster, and the Mikey Way Mustang Bass.